Annnd we’re back! As much as I’ve always loved this particular feature, truth is I just got run down in the later half of the year and wanted to try something new. However, by popular demand, the Monthly Interview is back! So, who would be first to help me ring in the glorious return? Well, considering on her word not one but TWO new categories for our yearly Best Of awards were created, I would be derelict if I didn’t start with an extremely intelligent and talented young woman who also happens to be a major schoolgirl pirate enthusiast! So I hope you enjoy this moment in time with writer, EVN editor and Editor-in-Chief of Keystroke Magazine, Shadocchi AKA Shadow. VNs Now: Hello Shadow! When I pitched this interview to you, I joked that you were seduced into visual novels. But, the more I looked into you it became clear that you were seduced into fiction writing well before that. How did you become interested in creative writing? Shadow: Well for starters it was my university major, so I have to have a little interest in it. Really though, I was writing short “books” and plays when I was 8 and I never really stopped. I got into article writing in high school, but prose and script were always my anchors. I like entertaining and writing is the best way I can express myself. It was kind of natural. VNs Now: What types of EVNs draw your attention? Is it a particular story or something deeper? Shadow: When I work on my usual freelance jobs, I often joke on Twitter about how terrible some of the sentences are. Like the one time I edited an article where the writer used a thesaurus on literally every second word, not knowing that the meaning changed. But those are the sorts of things I really have fun with. So on one hand I like to help out with projects that just need a little polishing to be great (like Analogue), while on the other hand I seek out projects that need a lot of work to show off their shine. Writers shouldn’t have to worry about their expression getting in the way of what they want to convey, and that’s what I keep in mind when working for someone. It’s not so much the story as it is the spirit. VNs Now: As a longtime editor, you’ve seen the EVN community go through many different phases and eras. Where do you think things are right now and how do you view the potential future? Shadow: Oh gee, I haven’t been around that long. I don’t think I’ve been involved enough to say anything with confidence. I’m enjoying all the new people being brought in by projects they like, or by discovering VNs through interactive fiction in general. I think right now it’s exciting to be in the EVN scene because there’s all this possibility of expansion. VNs can be ported to Mac, Linux, Windows, PSPs, iOS devices, Andorid stuff, the OUYA, browsers… It makes me really interested in seeing how people read things on different devices and learning how to optimize that. Of course, seeing how other aspects change between devices is interesting too. I think one of the things that could drag all this expansion potential down is the “VNs aren’t real games” debate, or people not liking all the new developers coming in. Let people make games! The worst thing that could happen is years later they are terribly embarrassed when they think about that game they made with catgirls they drew themselves. The best thing that could happen is new games! 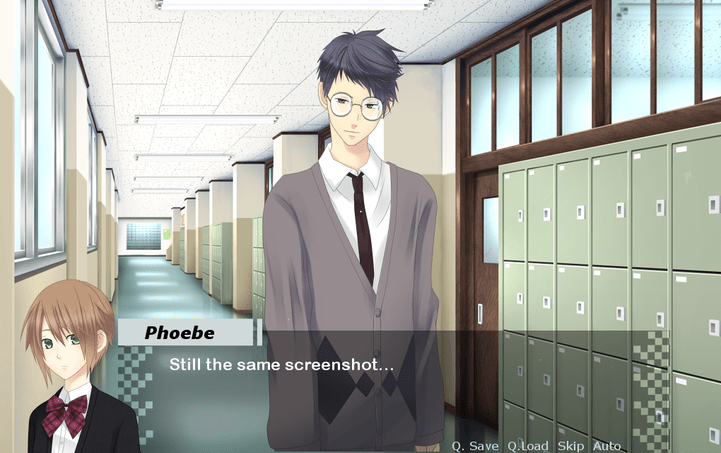 VNs Now: You have recently started work on an EVN yourself for NaNoRenO 2013: My Angsty Classmates. Now, the sheer fact that you’re still talking means that you haven’t drowned in teenage angst just yet, so what we can expect from your delightful emos? Shadow: Shhh! You weren’t supposed to find it! If you look carefully it was actually my 2012 project, changed to 2013, then changed to “I sure hope nobody finds this”. Even though otome games don’t appeal to my, uh, interests, I find them really fun to play, so I thought I’d give making one a shot. And now here I am with my MC talking to a guy clad in black armour, asking him if he’s a literal white knight, to which he responds “Can’t you see I’m wearing black?”. It’s the pinnacle of my career, I tell you what. (I don’t have solid plans on letting it see the light of day). VNs Now: You have a number of online fiction magazines under your belt with the newest one, Keystroke Magazine, launching this year. What are you looking to accomplish under the Keystone banner? Shadow: More than one years’ worth of issues! I just want to continue my work from Nocturnes, hopefully help people get that warm-and-soft feeling from seeing their work published. Expand into other formats. Get some nice non-fiction work. I’m not too ambitious. VNs Now: As E-I-C ,what type of stories are you looking forward to being submitted to you and is there one genre you really want to see more of that isn’t usually pushed in popular fiction? Shadow: When I helped read submissions for another online magazine, I really enjoyed some of the bizzaro fantasy stuff they got. Though it was mostly because those stories had strong voices and were fast-paced. I also really like some of the sci-fi stuff that has been sent to us. I do have a soft spot for general fiction though. I wouldn’t mind seeing some Magical Realism, though the new thing I’m hoping the most for is creative non-fiction. VNs Now: Finally I’d like to try a little something new here since this is the first interview in over six months: just a bit of a lightening round for you. Just tell me the first thought that comes into your head…GO! · Christine Love: PINK. PINK BURNING INTO MY EYES. I’m sorry Christine; you’re still a lovely person. · Heroes and Villains: Green and capes. I haven’t seen much in the way of typical heroes and villains lately. · Schoolgirl Romance: It isn’t forbidden love at all! · Skyfall: Adele. The song keeps playing on the radio, man. · Choice: My thesis. I thought “why not look into choice as my final, huge, worth-half-my-final-grade thesis?” Never again. VNs Now: Thank you so much Shadow for sitting down with me and good luck on all of your projects! Follow all of Shadow’s adventures on her blog, Insist on Plot!